A walking tour based on the stories and people of any space; a little often visited part of town, such as the deepest Docklands or even a twisted slant on a well-known cultural institution. Memento integrates fiction into real historical facts to create an exciting experience that makes the audience look at the local area and it’s history in a new way. Put your headphones on and switch on your senses. This forms the second part of the ‘Memento’ series – the first ran in 2010, also East London based at Trinity Buoy Wharf, supported by Courvoisier. Memento – Limehouse Town Hall, uses audio to guide listeners through the grand stories and little-known people of this building with a past. Looking at the first 50 years of it’s life from 1881, moments come alive through character driven narratives, heart-warming soundtracks and things to touch, taste, see. Take a memento from your experience or leave one behind. Audio: If you miss the event, you should be able to listen and walk another time from the new year – provisional dates so far are Sun Feb 24th and Sun Apr 28th 2013. 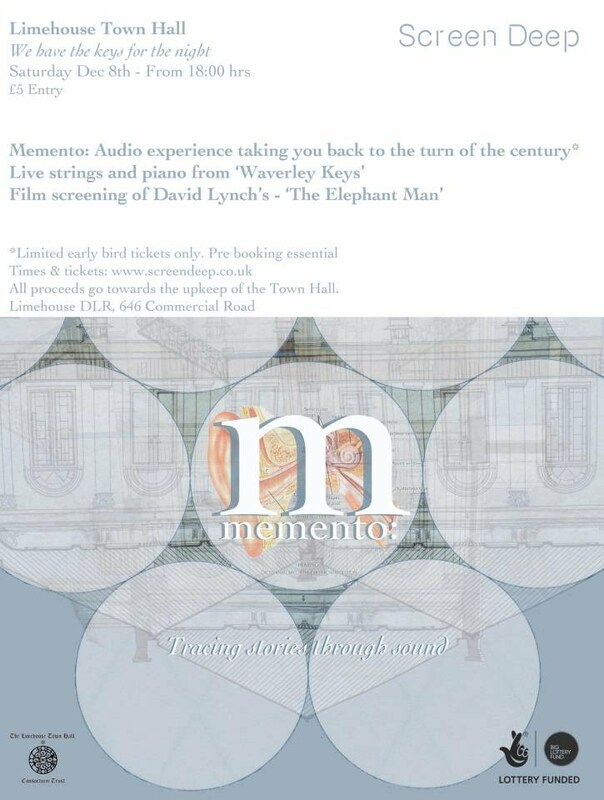 Come for some history on headphones with Memento, live piano and strings from Waverley Keys and a big screen viewing of David Lynch's The Elephant Man. We have limited tickets available for the Memento audio walking tour based on the stories and people of the Town Hall. Looking at the first 50 years of its life from 1881, moments come alive through character driven narratives, heart-warming soundtracks and things to touch and see. Take a memento from your experience or leave one behind. Please note: not suitable for under 14s, no wheelchair access. 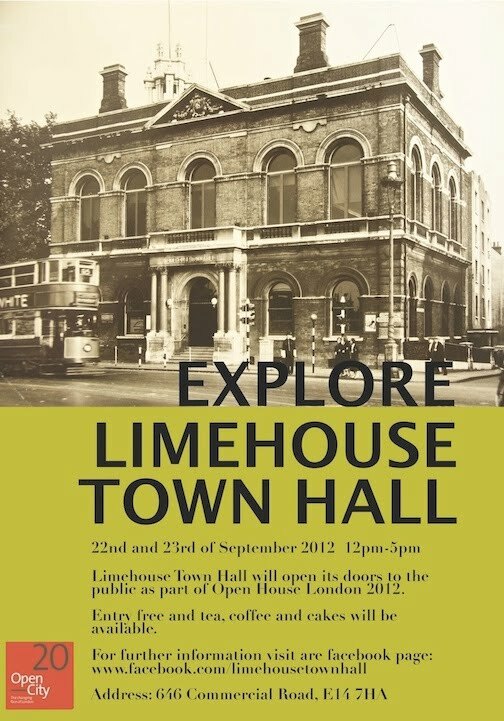 The Limehouse Town Hall Consortium Trust would like to invite you to join us in exploring the history of the Town Hall on the weekend of 22nd/23rd September! Our building, which is usually not open to the public, will participate again in London's Open House event from 12-5pm on both Saturday and Sunday. We have been busy working on an educational and fun audio piece for our visitors and shall be serving refreshments in the Grand Hall! The Musical Director of Olivier Award winning La Boheme and guerilla opera-makers The Wedding Collective re-imagine Madame Butterfly; one of the most hauntingly beautiful operas ever made. Nagasaki, 1948. In a country ravaged by war and destruction a young man returns home, searching through the rubble for memories of his mother, a beautiful geisha called Cio-Cio-San but known to the world as Butterfly. Torn away from his Japanese homeland and brought up in America, Lt. Benjamin Franklin Pinkerton, Jr. is forced to confront his true heritage as well as his father's monstrous act of betrayal. Sung by a cast of professional opera singers and using Puccini's original score, Finding Butterfly picks up where the original masterpiece ended, tracing Butterfly's final tragic steps and featuring the best known and loved arias from one of the most iconic works in the opera canon. Performed as an operatic, site specific play in Limehouse Town Hall, with words in English and an Italian libretto. In addition to the Grand Hall we now offer the Community Space for hire. Whether for meetings, workshops, educational classes or your other projects, this may be the space you have have been looking for. Both the Hall and Community Space can also be hired jointly. We are offering very competitive introductory rates for cooperate entities and charities. If you are interested in hiring the Grand Hall or the Community Space for your event and to obtain more detailed information and rates please click here. The Grand Hall of the Limehouse Town Hall has recently been used as set to several theatre, drama and dance productions, been facilitated as concert venue and art gallery as well as being used to host functions. 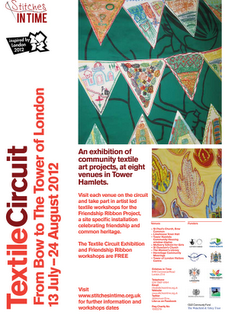 From 13th July to 24th August Stitches In Time's Exhibition "Textile Circuit" will be shown in the Community Space, which we are all very excited about. The Trust is also delighted to let you know that it has been granted the London 2012 Inspire Mark in this context! We are pleased to announce that, as of around 25th April, the roof and other high level repairs to the Town Hall were effectively completed. This is fantastic news for the future of the building, as with regular maintenance it should be watertight now for thirty or forty years at least, allowing the Trust to plan with confidence for the larger-scale works to refurbish and adapt the building for 21st century community use. The repairs to the slates, lead gutters and flat roof were carried out just in time to avoid water pouring into the building over the last couple of very wet weeks. The flat roof in particular had started to deteriorate so badly that there is a strong possibility the building would have become un-useable at some point later this year if the repairs had not been carried out. We are enormously grateful for the support of English Heritage, the London Borough of Tower Hamlets Conservation Office and the Isle of Dogs Community Foundation, without whose help the works would not have been possible. We are also grateful to the contractor, Isis Restoration Limited, for the high quality of the work they carried out. Unfortunately the repairs took longer to complete than expected, and have ended up costing more than expected, so we are still gratefully accepting any donations to help us pay the contractor's final bills. Any cheques should be made payable to 'Limehouse Town Hall Consortium Trust', writing 'roof repairs ' on the back and letting us know if you would like a public acknowledgement rather than just a private but very big 'thank you'! We would herewith like to invite you to our Spring Bazaar! If you are looking for something to do with your family or want to see what is happening with different community groups in the Tower Hamlets area, pop on down to Limehouse Town Hall on the 31st March! Local community groups will be hosting various stalls and informal creative workshops will be taking place throughout the day. Stitches in Time, a local, visual and textile arts organisation will be hosting workshops the entire day. Come check out a bike powered lightbulb at the Hackney and Tower Hamlets Friends of the Earth stall. Join Jamie and Darren for some crafting at their 'Sparks Themed Arts and Craft Spectacular Stall. Bring some money to take away some lovely plants at the East London Garden Society Stall or sample some fine and tasty homemade cakes! We will have musical entertainment during the day by jazz singer Chantal Santos, folk singer/ songwriter Caroline Grannell and folk and acoustic singer/songwriter Nicola Jane Stevens. We will also have on display, photography by local photographer Marian Spiers. There will be an opportunity to see what the plans are for the building, and to give the Trust your ideas for, and memories of, the place. The Limehouse Town Hall Consortium Trust would like to wish you a Merry Christmas and a Happy New Year 2012. The Limehouse Town Hall Consortium Trust would like to invite you to join us in exploring the history of the Town Hall on the weekend of 17/18th September! Our building, which is usually not open to the public, will participate in this year's London's Open House event from 12-5pm on both Saturday and Sunday. there will be a talk by architectural historian Kathy Clark on Sunday at 3pm in the Grand Hall. In March 2011 the Limehouse Town Hall Consortium Trust presented an exhibition on the history of Limehouse Town Hall, researched by architectural historian Kathy Clark. The exhibition offered the visitor some fascinating glimpses of the past life of the building and its place in the local social fabric, as well as a rare chance to see inside the Town Hall itself, which currently is not normally open to the general public. We have now transferred key aspects of the exhibition into a document- even if you did not have the opportunity to visit the exhibition, you can now view much of it by opening the PDF attached in the history section. people who can tell us a thing or two about what the hall used to be. Come along and we will give you the tour (or, you can give us a tour). discussion, so send us any ideas! The show runs from Wednesday June 22nd to Saturday July 16th. Press Night June 23rd. The Limehouse Town Hall Consortium Trust is delighted to present an exhibition on the history of Limehouse Town Hall, researched by architectural historian Kathy Clark. The exhibition offers the visitor some fascinating glimpses of the past life of the building and its place in the local social fabric, as well as a rare chance to see inside the Town Hall itself, which currently is not normally open to the general public. The exhibition explores the life of the building from when it was erected as a vestry hall in 1879-81, and alongside it some key aspects of the history of Limehouse and its people. It gives insights into the architecture itself, and how this neoclassical survivor of the blitz has changed over time, as well as the many diverse uses of the building, ranging from welfare centre, to museum, to bustling hub for entertainment of all kinds. It also explores the particular link of the hall and the local area with the labour movement. The exhibition is based around contemporary and modern photographs, plans and newspaper cuttings that paint a richer picture of the building’s history than has previously been available, and forms part of a project to expand that picture with the help of local people, who will be able to contribute their memories of the Hall to the Trust’s developing timeline of the building by having them recorded on the afternoon of Friday 25th March. Over the next two or three months we will be carrying out some essential repair and maintenance work on the building’s fire alarm and emergency lighting systems. We also hope to start the first main phase of repairs to the building, aimed at making it watertight, which will include the re-slating and repair of the roof, replacing or repairing the gutters and drainpipes, and repairing more of the large first floor windows. We’ve discovered, in the Bancroft Library collections, a full inventory of the Town Hall from 1881, when it was first built, which lists all its features and fittings. We hope to use this to get a definitive list of all the original features that remain intact. We’ve discovered that Jewish weddings took place in the Town Hall in the 1890s. We’ve confirmed that when the building was a vestry hall it was used a dance venue, cinema, concert hall and theatre venue.